In less than 1200 miles and ten nights, you will go on a circle tour of Southern California taking in some of the most amazing spectacles. From Disneyland to Giant Redwood Trees; from Yosemite to Big Sur; from Hearst Castle to Malibu beach... All so different and all so amazing. After picking up your motorhome at El Monte RV Los Angeles location it's just a 15 minute drive south to your first night stop in Anaheim (www.anaheimresortrvpark.com ). The campground has a shuttle leaving every 20 minutes to Disneyland so, once checked in, why not leave your RV and you're off for a wonderful evening of fun. (www.disneyland.disney.go.com) Stay for the fireworks then home for your first night in your motorhome. The longest drive on this trip takes you north, headed for the Giant Redwoods in Sequoia National Park . You'll start by retracing your steps on Interstate 5 and once out of the metropolitan area will have Los Padres National Forest on your left and Angeles National Forest on your right. Just beyond Lebec you will come onto Route 99, headed for Bakersfield (you should reach there a couple of hours after starting your journey from Anaheim). Bakersfield (www.visitbakersfield.com) is home to the largest collection of Basque restaurants in the United States, you may want to stop for breakfast or lunch. Continue north until Visalia where you may want to stock up with food. Then head toward Sequoia National Park. At Three Rivers you will find Sequoia RV Ranch (www.sequoiarvranch.com ), just 8 miles from the entrance to the Park. Several sites at Sequoia RV Ranch are alongside the river so, when you book, do tell them if you'd like this position. Overall a 5 hour trip but not so many miles. The National Park roads are much slower than the highway and you have a few miles of slower roads at each end of today's journey. 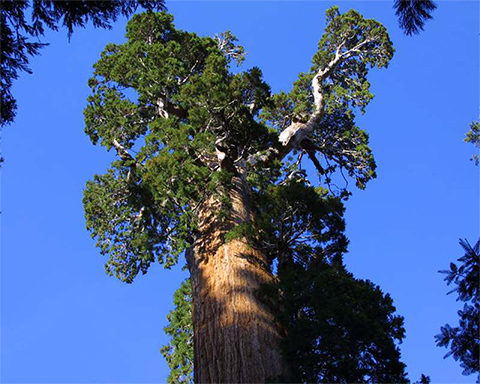 First enjoy about 66 miles driving through parts of Sequoia and Kings Canyon National Parks. Do some research (www.americansouthwest.net/california/sequoia/national_park.html) as the Giant Redwoods are in a relatively small area in these Parks. Once you hit Route 41, head north through the town of Fresno and then, just after Oakhurst, drive though the Sierra National Forest until you reach the south part of Yosemite National Park. You are heading for Yosemite Village where there are a number of National Park Campgrounds to choose from (see www.recreation.gov & www.nps.gov). 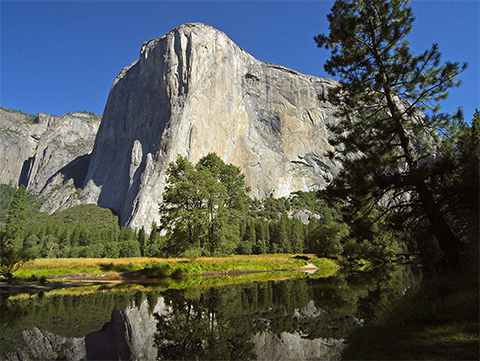 These websites will not only give you details of campgrounds you can pre-book but they will also tell you about the amazing things to be seen in Yosemite. After a day in the city enjoy 2 nights at Moss Landing KOA (www.koa.com). This will be your base for a tour of the Monterey peninsula tomorrow but this first day will probably be a good one for R & R to relax after a couple of long drives. Moss Landing is in the heart of the Monterey Bay Sanctuary. With it's fish restaurants, antique shops and art galleries, this really is old fashioned seaside Americana. Today take the opportunity to visit Monterey (www.monterey.org) and Carmel (www.carmelcalifornia.com) ; to take the beautiful '17 mile drive' (www.beachcalifornia.com/17mile.html) and to visit Pebble Beach (www.pebblebeach.com). No rush, no hurry. Return to Moss Landing at your leisure. On your journey south today you may want to stop for a while at Julie Pfeiffer Burns State Park (www.parks.ca.gov) to take the short, 1/3rd mile easy walk on McWay Waterfall Trail. It'll take you to an overlook facing McWay Falls, an incredible 80-foot waterfall that drops directly onto the sandy beach. You are next headed for San Simeon and famous Hearst Castle (www.hearstcastle.org) built on land William Randolph Hearst inherited from his mother. Originally known as "Camp Hill," its wilderness originally offered a place for family members and friends to "rough it" on camping trips. Hearst envisioned more comfortable accommodations and by 1947, they had created an estate of 165 rooms and 127 acres of gardens, terraces, pools and walkways amidst the 250,000 acres which make up the estate. Today head south from San Simeon to Pismo Beach and Pismo Coast Village (www.pismocoastvillage.com). After about 35 miles you'll come to Morro Bay State Park which features lagoon and natural bay habitats. The bay's most prominent landmark is Morro Rock. The park museum has exhibits that cover natural features and cultural history, Native American life, geology, and oceanography. It would be a nice place to make an interim stop, even though today's journey is a short one. Once you get to Pismo Beach (www.classiccalifornia.com ), a classic beach town famous for its dunes, it's all about relaxing. Pismo Beach is surrounded by golf courses. There is horseback riding on the beach, fishing off of the pier or surfing next to it and a selection of trails to explore. The spectacular Monarch Butterfly Groves is on the southern boundary. (www.monarchbutterfly.org) Alternatively, just sit and look out for whales, otters and elephant seals just offshore. As you wave goodby to Pismo Beach, you are heading for one of those 'iconic' California places... Malibu. Who knows, you may even bump into some famous! You can drive down on Route 101 directly into Malibu or come off the main highway through coastal towns such as Mission Hills, Lompoc and Isla Vista. A stop at Santa Barbara might be fun too. When you arrive at Malibu Beach RV Park (www.maliburv.com) your site will have either an Ocean or Mountain View so when booking, it's worth saying which you'd prefer. Whale watching is a great activity in March, April, October and November and you can watch dolphin's all year round. Ocean swimming, body surfing and beachcombing are also favourite activities. And of course, there's always star spotting either here or in Beverley Hills, just 23 miles away. Returning your motorhome in time to Santa Fe Springs should not be a worry as you are just 45 miles away.